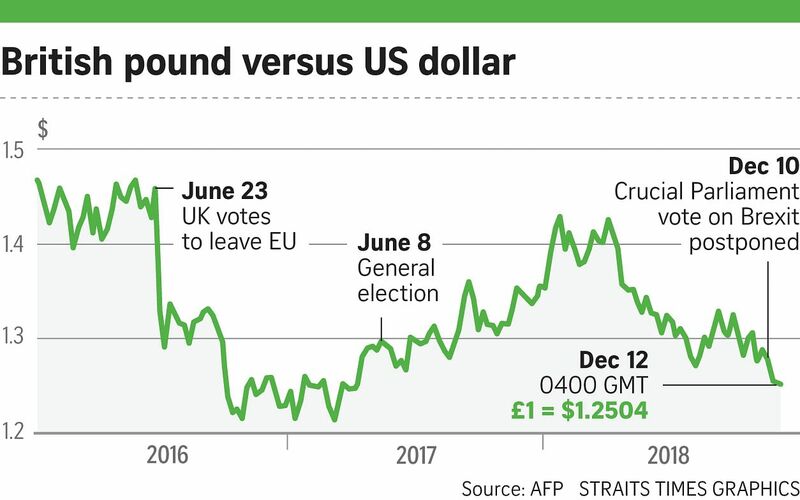 LONDON • The British pound rose yesterday as Prime Minister Theresa May vowed to fight a challenge to her leadership and warned rebels within her party that they risked delaying or even stopping Britain's departure from the European Union. The pound had fallen to 20-month lows overnight after lawmakers in Mrs May's Conservative Party gathered enough support to trigger a no-confidence vote in her leadership. But it then stabilised as some investors bet that Mrs May would win yesterday's vote and, in the process, isolate opponents in her party who seek a total break from the EU. The ballot, which was to be held between 1800 GMT and 2000 GMT yesterday (2am and 4am Singapore time today), has further disrupted Mrs May's Brexit plans after she delayed a parliamentary vote on her blueprint on Monday. With less than four months until Britain is due to exit the EU on March 29, Mrs May warned eurosceptic hardliners that if they toppled her, the departure from the EU would have to be delayed and perhaps even imperilled. "Even though there's tremendous uncertainty and we've reached a low in Britain's institutional crisis, we are a touch positive on the pound," said Mr Giuseppe Sersale, fund manager at Anthilia Capital in Milan. "We don't expect anyone will want to take responsibility for a hard Brexit and we think the worst-case scenario can be avoided." The pound rose as much as half a per cent to US$1.2551 from below US$1.25 earlier in the session. It stood at US$1.2523 by 1030 GMT. Against the euro, the pound rose 0.3 per cent to a session high of 90.255 pence. Analysts at Nomura said they expected Mrs May to survive the vote because it had taken a long time for opponents to get the 48 letters needed to trigger a ballot, and because many lawmakers had a lot to lose in a change of leadership. Other analysts were far less confident about Mrs May's chances, with those at MUFG saying there was "a high probability" that she would be defeated. Traders warned of more volatility for the pound regardless of the outcome - if Mrs May wins only narrowly, her position will remain vulnerable. Should the government be led by a so-called hard Brexiteer opposed to Mrs May's withdrawal deal, or if Parliament voted for a disorderly Brexit scenario, the pound could lose 5 per cent as the focus turns to "potential capital flight" from Britain, said Mr John Normand, head of cross asset fundamental strategy at JPMorgan, while adding that this was not his base case. Mrs May will also seek a parliamentary mandate for her deal, probably before Jan 21. She is meeting EU leaders this week to try and get her Brexit withdrawal agreement tweaked to convince her sceptical colleagues. The Prime Minister had been expected to lose Tuesday's cancelled vote on her agreement with Brussels, with opposition parties and many within her party angry that the deal, in their view, would leave Britain worse off overall. A range of Brexit outcomes remains possible, from a second referendum with the British public to a no-deal Brexit to a delayed Brexit.